In the 1930's, a dedicated California scientist discovered an inexpensive cure for many life-threatening diseases, including Typhoid Fever, Tuberculosis, Streptococcus Infection, and amazingly, Cancer. Rife's discovery was so revolutionary, it promised to eliminate all germ-created disease. Royal Raymond Rife not only identified two viruses that cause cancer, he also discovered a cure, and during clinical trials, "hopeless" cancer cases were cured. This should have been a time for great rejoicing, but the established medical community would suffer a severe blow if an inexpensive cure were found. In an effort to suppress the news of his breakthrough, a massive cover-up was started involving blackmail, conspiracies, arson, vandalism, theft and bribery. His associates were harassed and imprisoned. Some of them were even murdered. This is his story. 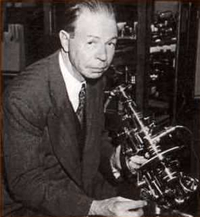 Royal Rife was born in Nebraska in 1888 and educated in the fields of optics, electronics, biology and chemistry. Medical research instruments were designed and built by him including spectroscopes and optical tools which are stil in use today. But his most famous invention was a 200-pound, 5,682 part Universal Microscope. Completed in 1933, the Universal Microscope allowed microorganisms as small as viruses to be viewed, live, as they went about their daily activities. This was a major breakthrough. Even today's high resolution electron microscopes kill the specimens being viewed. Rife used a complex set of polarizers and rotating prisms to make his biological samples visible. Instead of staining the specimen, the light itself was the stain. One type of bacteria would appear a specific shade of blue, another red and so on. "Bacilli may thus be studied by their light, exactly as astronomers study moons, suns, and stars by the light which comes from them through telescopes. The bacilli studied are living ones, not corpses killed by stains." (Quoted from Los Angeles Times Magazine Dec 27, 1931, referring to an earlier version of Rife's microscope). Rife's remarkable breakthrough that used a new approach to bend light, allowed living viruses to be observed for the first time. As a result, Rife supplied direct evidence that bacteria could change their form and transform into a viral equivalent. This discovery, called pleomorphism, countered commonly held beliefs about germs. Modern medicine says that germs are monomorphic. Monomorphic means that a single bacterium exists in only one fixed state. Rife blew this concept apart by his own observations. He insisted that each bacterial pathogen had a corresponding viral form, and, depending on the mixture of proteins that the bacterium digested, could transform into a viral form and then back to a bacterial form. Once Rife could watch the life cycles of microorganisms, he hoped to find cures for diseases. If he could see how living organisms respond to stimuli, he believed he could devise ways to destroy them. The stimuli Rife used consisted of frequencies produced by a ray machine. The frequencies were delivered in the Radio Frequency (RF) range. An electrical current was sent through a tube filled with noble gases, mostly argon and neon. The gas would light up the tube, and the frequencies were emitted as EM radiation. It was the EM wave, rather than the luminescence from the light, that disabled or killed the pathogens. If Rife exposed a virus or bacterium to a particular frequency and the pathogen began to vibrate, and then grew weak or broke apart, Rife knew that he had found a resonant frequency. The microbe's frequency or the number of cycles per second at which it vibrated, was known as its Mortal Oscillatory Rate (MOR). Any object has a natural or resonant frequency. Strike it, bump it, pluck it, or heat it, and it will tend to vibrate at a specific frequency. This applies to a bone, a piece of wood, a molecule, an electron, or a guitar string. The classic example of resonant frequency is a singer breaking a wine glass when its resonant frequency is applied. Rife observed living microorganisms under his microscope, exposing them to various electromagnetic fields. Each type of microbe appeared to respond to one or more specific frequencies. Those particular frequencies ultimately caused the destruction of the organism. Rife repeated his experiments with thousands of samples and reproduced the same effect every time. The critical frequencies that destroyed pathogens were catalogued. He started a list of what he called the Mortal Oscillatory Rates (MORS) of specific pathogens. He was unable to find any frequency that would cause human or other mammalian tissue cells to disintegrate or explode in the same way. This led to choosing different frequencies to determine which ones caused the disease organism to be destroyed or "blow up" in the field of his microscope. Eventually, Rife's Ray machine applied these lethal resonant frequencies to the body to eliminate disease. Sadly, most of the meticulous notes which Rife recorded have been destroyed. He was obsessed with his work, spending days at a time without sleeping, leaning over a microscope, tuning the device and cataloguing the effects. Close friends of Rife called him Roy, and loved his gentleness and humility, while being awed by his genius. Not only was he a brilliant scientist, he was an accomplished musician playing both the guitar and French horn. He also held a motorboat speed record. Though he had no children, he was married twice, outliving both his wives. But of all these interests, he was especially motivated to find a cure for cancer. In 1938, Rife's hard work paid off. He identified two different viral agents that caused cancer - one that caused carcinomas (cancers of the covering and lining membranes of organs) and one that caused sarcomas (cancers in the bone, connective tissue or muscle). On May 6, 1938, The San Diego Evening Tribune announced that Rife's "energy medicine" successfully destroyed the microbes associated with cancer and other diseases. "The discovery promised fulfillment of man's age-old hope for a specific destroyer of all his infectious diseases." Organisms from tuberculosis, cancer and typhoid were among many which the scientist reported killed by the waves. With the frequency instrument treatment, no tissue is destroyed, no pain is felt, no noise is audible, and no sensation is noticed. A tube lights up and 3 minutes later the treatment is completed. The virus or bacteria is destroyed and the body then recovers itself naturally from the toxic effect of the virus or bacteria. Several diseases may be treated simultaneously. The first clinical work on cancer was completed under the supervision of Milbank Johnson, M.D. which was set up under a Special Medical Research Committee of the University of Southern California. 16 cases were treated at the clinic for many types of malignancy. After 3 months, 14 of these so called hopeless cases were signed off as clinically cured by the staff of five medical doctors and Dr. Alvin G. Ford, M.D. Pathologist for the group. The treatments consisted of 3 minutes duration using the frequency instrument which was set on the mortal oscillatory rate for 'BX' or cancer (at 3 day intervals). It was found that the elapsed time between treatments attains better results than the cases treated daily. This gives the lymphatic system an opportunity to absorb and cast off the toxic condition which is produced by the devitalized dead particles of the 'BX' virus. But it was not to be. Those in influential positions who could promote Rife's ideas just would not listen, but instead suppressed the research. Many of the health practitioners who embraced Rife's technology were forced to abandon. Clinics and labs were burned and vandalized. Doctors who were photographed at a banquet honoring Rife's achievements were later coerced to deny they ever knew him. Royal Rife died in 1971, a broken and bitter, eighty-three year old man. Sadly, the clinical records of his work have been erased from the archives of the scientific community. But Rife's discoveries did not remain buried. In 1987 Barry Lynes wrote a book, The Cancer Cure That Worked, that ignited a grassroots movement to research what Rife had discovered and build Rife machines using modern electronics.